The Dulwich Midsummer Relay race takes place in Dulwich Park, London. It is hosted by Dulwich Runners and billed as an approx 1 mile relay. We pre-registered our team using an online form and paid the £12 entry fee on-the-night. As a note on our team - two of us are with Dartford Harriers and one with Dartford Road Runners, so we used Dartford United as our team name for the evening. The race is a 3 x 1 lap of the main inner loop that runs through the park. Anyone that has visited Dulwich parkrun will be familiar with the route as it uses exactly the same path - the only difference being that you only have to run one lap rather than three. The loop itself is around 80 metres longer than a mile, so if you run here don't get too disheartened if your time is a little slower than what you would expect over a perfect mile course. By the way, the route is very simple to follow and there's no way of getting lost providing you stay on the loop and don't follow one of the exit spurs. Underfoot is 100% tarmac and it's flat - you might feel the slight sensation of a tiny upwards elevation change during the latter part of the lap, but that is all. The start time was 7.30pm and after a team warm-up we were all ready to go. As far as organising our team running order was concerned, we stuck with our tried and tested formula of predicted slowest first through to predicted fastest last. My recent 1 mile races  had seen me run 5.57 at the Westminster Mile and 5.47 at the Swanley Relays, so I was hoping to continue the sub 6 minute streak. However that extra 80 or so metres made it impossible to achieve and I ended up with a 6.06 time for my leg. There is, helpfully, a Strava segment set up on the loop which looks to be pretty spot-on a perfect mile, so by using that as a guide it looks like my 1 mile time would have been approx 5.44. 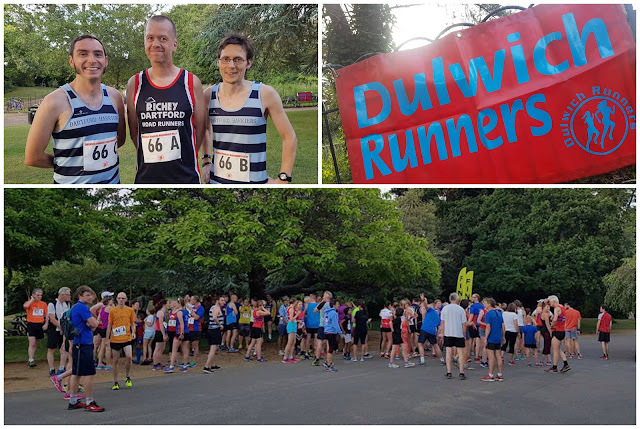 It was a lovely evening for the race and we had a great time being hosted by the friendly folks from Dulwich Runners. We followed the race up with a visited to the Fox on the Hill wetherspoons pub for some well earned food and a drink. Good times.